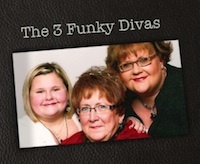 The Divas represent 3 generations of artisans… the mother, daughter & granddaughter trio of creative minds have been making art for a combined 50+ years. Owner & instructional designer, Kathy, has been working with various art forms all of her life. The concept for the Divas has seen many changes over the years, with the most recent focus on unique, one-of-kind custom jewelry beginning in 2005. Our color expert and portrait artist is Kristin. She can recreate designs using photographs of your prized possessions, a loved one, a favorite pet, or from a landscape. Our youngest Diva, Emiley, brings lots of great ideas from a KIDZ point of view. Specificially focused on marketing to the pre-teen to 20-something audience, she promotes our art and designs at school, on our social networks on Facebook and Twitter, and is our best spokesperson when we do a show. Kathy . . . holds a Bachelors’ of Fine Art in graphic design and fine art from Eastern New Mexico University, and a Master’ in Science in Educational Media Design & Technology from Full Sail University. She received specialized training in metalsmithing from master jeweler, Paul Woods, and in casting & fabrication from Gregg Senn. Kristin . . . holds a Bachelors’ in Education with majors in fine art and K-8 special education. Her specialty is portraiture and photo realism. Emiley . . . is the youngest artist, creates designs for our KIDZ line, specializes in polymer and metal clay assemblage, and assists with marketing & show displays. What’s more fun than a party? The Divas love to entertain… thus, we love to hold trunk shows & home parties. Contact us by email to get the details for hosting your special home show. The Divas can be seen being fun ‘n funky at several shows & exhibits each year; follow our blog and watch for upcoming events! Handmade creations by The 3 Funky Divas have been a way for us to take a lifetime of passion for art, color, and design, and turn those creative moments from our discoveries and dreams into unique, one-of-a-kind handcrafted accessories. Our collection of handmade jewelry includes customized pieces and redesigned vintage collectables. Our artwork is inspired by nature and the world around us, and often incorporates photo manipulation from our journeys and adventures. And the collectible memorabilia that we have found on our travels, will bring back many memories from various eras from the 30s to the 80s. Each piece of jewelry is individually designed and handcrafted by the Diva Artisans, Kathy Valunas, her daughter Kristin and her granddaughter, Emiley. The collections are inspired by various themes and color combinations, and are modern and contemporary as well as memorable and vintage. Each piece captures all the grace and artistry of traditional jewelry designs produced with high quality materials and skills. Each original piece of art is hand drawn, fabricated, painted, or digitized to produce a unique and innovative limited edition work of art. The ACEO’s are comprised of various subject matter, some with a theme or reminiscent of family and ancestral heirlooms. These miniatrue collectible art trading cards, make wonderful gifts and can be custom ordered. Each treasure in our memorabilia collection is one-of-a-kind, and are limited to what is shown in the gallery. If you find something you love and want, place your orders immediately because once a treasure has been sold… it is gone forever! Techniques & Materials . . . Creating unique designs requires a myriad of materials and techniques. In our studio in Texas, we incorporate wire wrapping, hand stringing, embossing and hand stamping impressions, inks, polymer and metal clays, resin and cast materials, and leather and recycled-repurposed materials along with found objects in our jewelry collections. Many items are hand forged or fired in our on-site kiln. We welcome special orders; however, due to fabrication methods and materials, we cannot guarantee that any two pieces will be identical to pieces pictured in our gallery. Even though our specialty is jewelry, we also create a variety of art from miniature ACEOs to larger water colors, monotype prints, lino prints, and pen & ink. The DIVAS use freshwater pearls, gemstones, sterling silver and gold findings, and mixed media enhancements from reputable jewelry and gemstone suppliers. Some materials have been hand picked from nature or fabricated in-house.